Well, I am working on this, but there is a small problem with double points. The labels begining with ".." are special case in FASM, so maybe I should not include them in the list at all. - it is in my To-Do list. Thanks for the help. Those problems with XP are really annoing. How did you fix the GetKeyState Word.dWord problem? (i had the same problem,... and i solved it by doing it all a completely different manner, that i am now happy with, but, i'd like to know your way...). Would be usefull as a Win32 Template. p.s. The AthlonXP 2600 isn't nominally 2600 MHz, it's only a brand commercial trick and mine is not overclocked. Well, it is actually not a problem. I simply read the help not very carefully. The function GetKeyState, returns the value with high-order bit = 1 if the key is pressed and 0 if the key is not pressed. The trick was that the "high-order" bit is actually 15-th bit not 31-th. 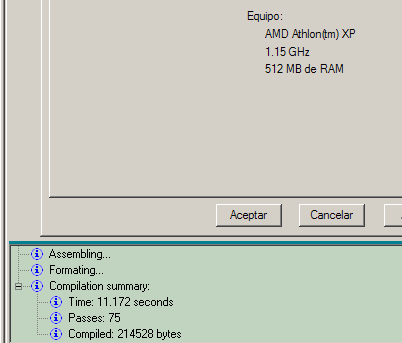 The other problem is that Win95/98 actually returns 32bit value where the eax is sign extended ax. (movsx eax, ax), so the 15-th bit still have the right value and 31-th bit have the same value as 15-th. In WinXP the high-order word of eax is always 0 (movzx eax, ax), so the only proper way is to check 15-th bit. If you make the test this way it will work on Win95 and WinXP without problems. The strange thing is that WinXP actually returns 16bit result, but Win98 returns 32bit result. And some people claim that Win95 is not truly 32bit OS. I upload at the site of Fresh the next WORK version with almost finished code completition behaviour and some compilation speed optimisations. There are changes in StrLib. If someone wants to improve it, please, use this version, it is with faster StrNew function. New work version uploaded... The file have a name: FreshWork1_0_1C_05.rar If you download another file, refresh cashes. I made some speed improvements and added detailed timing report in compilation messages. Please, give me some detailed feedback how Fresh compiles "Fresh.fpr" on different platforms. I am trying to download the new file, but it is not possible. ??? I am trying to download the new file, but it is not possible. Sorry, it is my fault. It should be OK now. 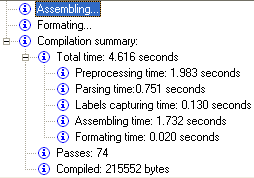 It's strange that preprocessing took so much, while on your mashine it was almost equal to assembling time. But on preprocessing stage, FASM works with file system. So, the low speed is because of WinME, IMHO. It is offtopic ofcourse, but WinME is too heavy for your machine. Better install Win95 (more stabble than 9 or Win98 lite - I am happy with it. Since I install it, my computer simply works without any problems. Pentium III 450 Hz, Windows 98 SE. Well, visibly I have to make something with preprocessing. It is too slow on almost every machine. But it will be in the next version. I want to finish the whole code completition. There is only one problem remaining - when you type local label begining with dot, Fresh should find what is current parent label and to show only his local labels in the CC box. Ah, and to make CC to work without compiling all the time of course. 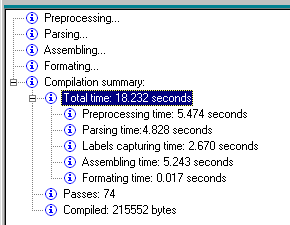 When I compiled FRESH with this version of preprocessor, I got 17 sec instead of 20. Hm, it is interesting. I know that some important procedures in the parser are aligned, but preprocessor is important too. Now I am plaing with implementation of binary search in the parser label lists. It will improve the speed of the parser on big source. Now parser uses linear search, and it is slow. On other hand, for the binary search we will need sorted hash array, that will slow adding new labels, but avery label is adding once, but searching many times. Well, definately it is not a good idea to change FASM sources, but I hope we can convince Privalov, to insert most important changes in the official release. Aligning Code is not that much important as aligning DATA really IS. So, if FASM does not does this automatically (i suppose it does not), and if this may be the case(s) that some Data that would not be aligned on their own Boundary, this is the very first thing i would do (really twice faster).